White Stripe Spawn #3 seems to have hatched earlier than expected. I was looking at the tank on Saturday, 9-13, which would’ve been the day to pull the tile, but the eggs were already gone. So they may well be on a 5 day schedule?! Meanwhile, Lightning Maroon Spawn #40 was laid on 9-10-2014. I’ll be out of town late this week, which means I won’t be able to properly tend to baby lightning maroons. So this batch, like the last, will be left to hatch and move one. I believe I’ll be in a good position to deal with Spawn #41 if the fish are back on schedule. By March 21st, both Mike and I were at zero for larval maroons from batch #26…we both crapped out. It’s now the evening of March 25th, 2014, and Mike left my fishroom about 25 minutes ago with a bucket and a tile; I’ll be out of town at the NEC convention this week followed by a visit to the Vermont-based home offices of CORAL Magazine, AMAZONAS Magazine and Reef To Rainforest Media LLC, so Mike and my wife get to pay attention to the fishroom in my absense. It makes more sense to have freshly hatched clownfish in Mike’s fishroom vs. my own, and the deal I’ve made with him is this – if he rears a good solid batch up, I owe him a Gold Nugget Maroon to pair with his existing Gold Stripe Female. Done deal in my book. What I’m more curious about is to see if Mike can fair better than I have been doing. Just on the ride home, 10 already hatched….which brings me to the other ongoing issue – as this morning, it was apparently that a good portion of the eggs had already hatched on the overnight from the 24th going into the 25th. Once again, only 5 days post spawn. Mike should get a solid hatch tonight (6 days post spawn), and he might even be able to get stragglers again on the 7th day if he plays his cards right. What’s up with the hatch spreading out over THREE days?! At any rate, this is what it looks like will happen for Spawn #27. Last week, the hatch of Spawn #26 approached. I’d been talking with Mike, at this point looking for really different way to approach the rearing problems I’ve been facing. The thought process was simple – send a tile over to Mike and see if he can do any better. Well, based on the 6-7 day model, Spawn #26 was due to hatch on either the night of the 12th, or 13th. Come the morning of the 12th, it looked like there had already been a big hatch…at least 50% of the eggs were gone. Easily half hatched on the only the 5th night! Well, I pulled the tile that night, gave it a H202 dip (4ml in 0.5 gallons for 15 minutes), and come morning of the 13th, probably 50-100 more larvae had hatched. And there were still viable eggs. So the afternoon of the 13th, Mike came over and grabbed the tile. And come the morning of the 14th, Mike had a few more babies hatched out. And so, by March 19th, the larvae I had dwindled to around 6 or so…and Mike was down to 1. 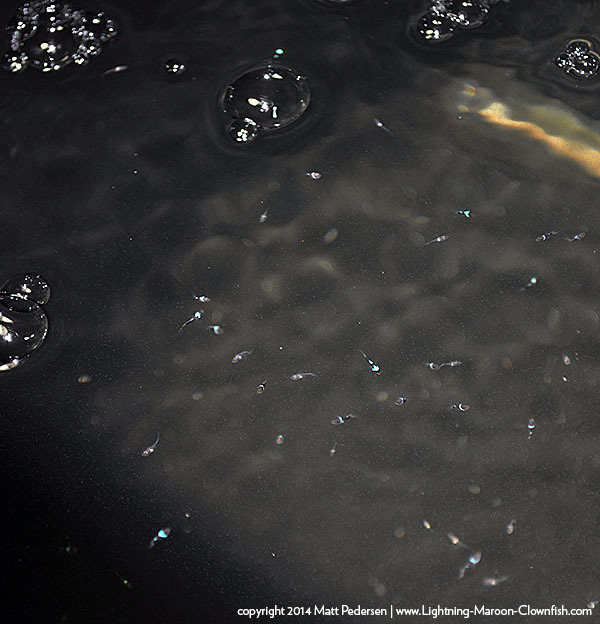 I noticed a very disturbing change in larval rearing; for some reason in this run, my larvae were floating on their sides…a very odd set of circumstances that only seems explainable by an internal gas buildup…odd seeing fish kinda stuck to the surface with headstripes forming. It’s been a busy January here, with my trip to Cleveland to give some well-received talks at C-SEA followed by a grueling week of fishroom preparation in advance of Reef Builder’s world-reknowned Jake Adams dropping by for a surprise visit and a bit of Q&A at the Lake Superior Marine Aquarium Club’s winter / holiday / new year bash. Of course, the Lightning Maroon breeding and rearing doesn’t stop because life gets in the way, but you better believe the online posts can sometimes drop in priority! Spawn #20 in the BRT, post metamorphosis, already easily discernable as white stripes or lightnings. During my time at C-SEA, my good friend and fellow clownfish breeder Mike Doty (you may recall he helped hatch and rear the very first Lightnings) was keeping an eye on the fishroom. For no reason, somewhere around the 17th or so, the babies in the 10 gallon just died. Mike can’t explain it, I can’t explain it. We’ve seen this happen before. Most recently, on the 28th I started a water change, which normally is done with a very slow siphon into a 5 gallon bucket, the intake being placed so that it won’t drain the tank completely. Well…I didn’t have it really clamped down, and so it drained the BRT ompletely. 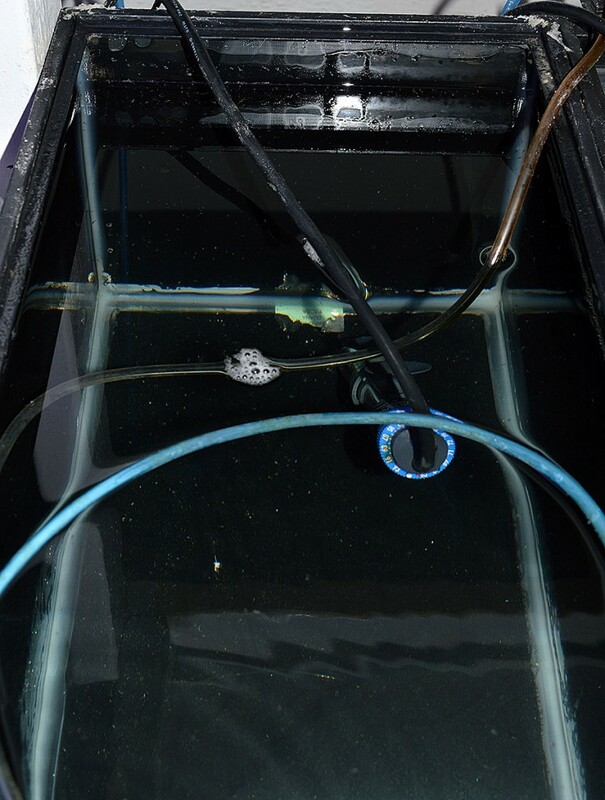 Those babies which were still in a couple mm of water survived the 99.9% water change, but those that were in shallower water – damp, but not submerged – were dead. 21 lost totally due to a preventable accident. The upside is that the fish took a very traumatic, near 100% water change, and yet survived. I’m guesstimating another 20-30 still alive. Either way, that shows you the losses through attrition that happen as these fish grow up – I stocked the BRT with 140 larvae. Spawn #21 – I left Spawn #21 more or less in the hands of Mike to hatch…a handful of offspring had hatched out on the morning of the 17th (pulling the nest on the 16th was 7 days post spawn), and later that afternoon I had to depart for Cleveland. Unfortunately, the tile fell overnight, so come the 18th, instead of Mike finding a bunch of larvae hatched out, he came over to find a dead nest. Spawn #22 – on the afternoon of 1/20/2014, the 22nd clutch of eggs was put down by the Lightning Maroon and her mate. Paying a close attention to things, I knew I could be pulling them as early as 6 days post spawn…so 21,22,23,24,24, evening of the 26th being 6 days on. Well, I took a gamble, left a little more ambient room light falling on the eggs, and found that on the morning of the 27th, we still had a nice, solid nest. Come the evening of the 27th, I pulled the tile along with 5 gallons of broodstock water and 5 gallons of new saltwater, and set them up with a wooden airstone incubation. I used a second tile to prevent the tile from falling, as well as to help weigh down and position the wooden airstone under the eggs. (I found my wooden airstones from eBay seller hoolko, who happened to be mentioned on Reef Builders a while back). Spawn #22 set up and ready for hatching in a 10 gallon tank. Note the larvae already hatched! Within minutes of transferring the nest, I had a few larvae hatch, still in full light. 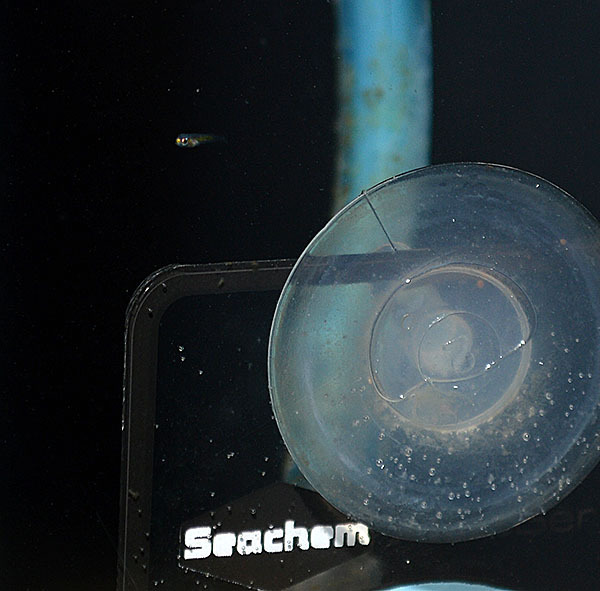 Newly hatched Lightning Maroon Clownfish offspring swims next to the Seachem Ammonia Alert Badge…. I left things go, not feeding or anything else. 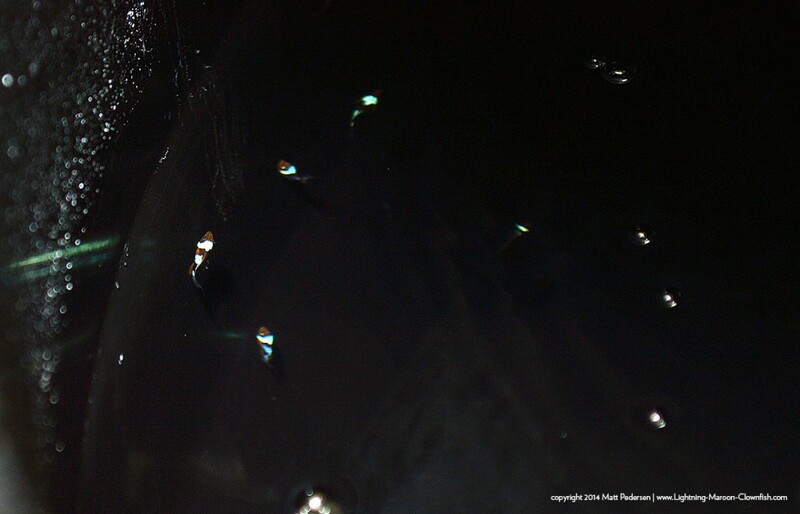 By the morning of January 28th, I had a few dozen larvae in the tank, but the bulk of the eggs remained unhatched. I weighed my options a bit, and ultimately decided to introduce some rotifers (about 2 gallons worth) but refrained from adding any phytoplantkon. I thought maybe I’d have more hatches later in the day, but come nightfall, nothing had happened. Would this be a botched hatch? Apparently yes and no. This morning (the 29th) several hundred larvae were present in the tank, but many many more dead eggs were on the bottom. 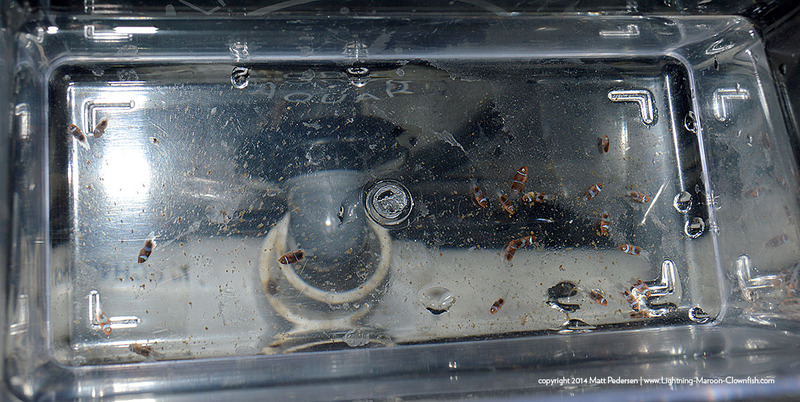 Most of the larvae held tightly to the black back wall of the 10 gallon tank. Spawn #22 after the large hatch, before cleanup. 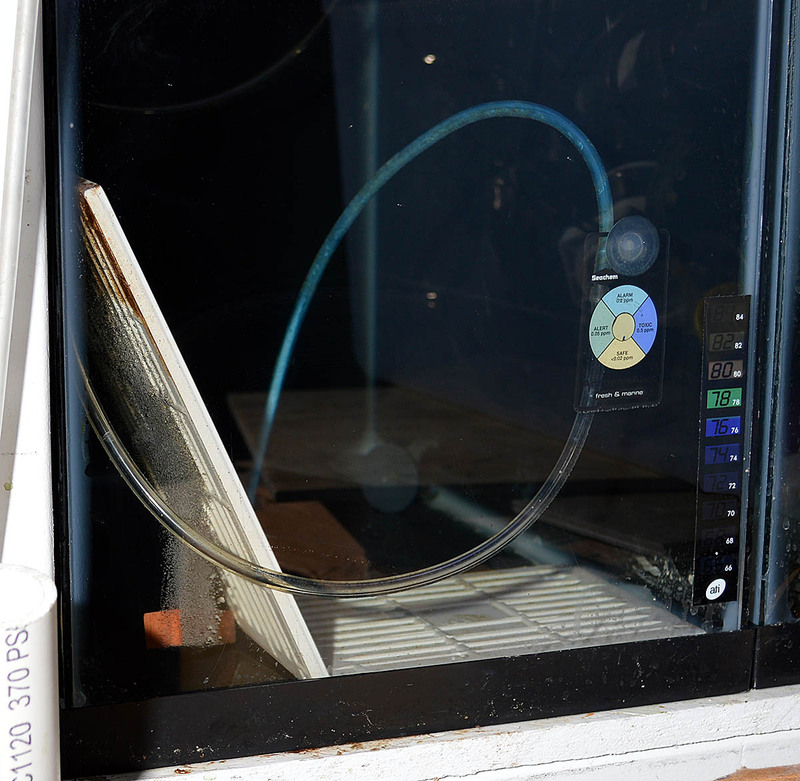 I took the opportunity to first siphon off all the dead eggs (and dead larvae) on the bottom before tinting the tank with 50 drops of RotiGreen Omega. Spawn #22 after cleaning up the larval tank. I gave the rotifers their morning feeding of RotiGrow Plus, and later this evening they’ll get the next infusion of rotifers. I’m thinking I will once again work on a system of water changes, lowering salinity, and 24 hour lighting, to grow this batch, and as I discovered, I will once again at minimum split the batch early on. So I finally pulled the trigger on pairing up my holdbacks. 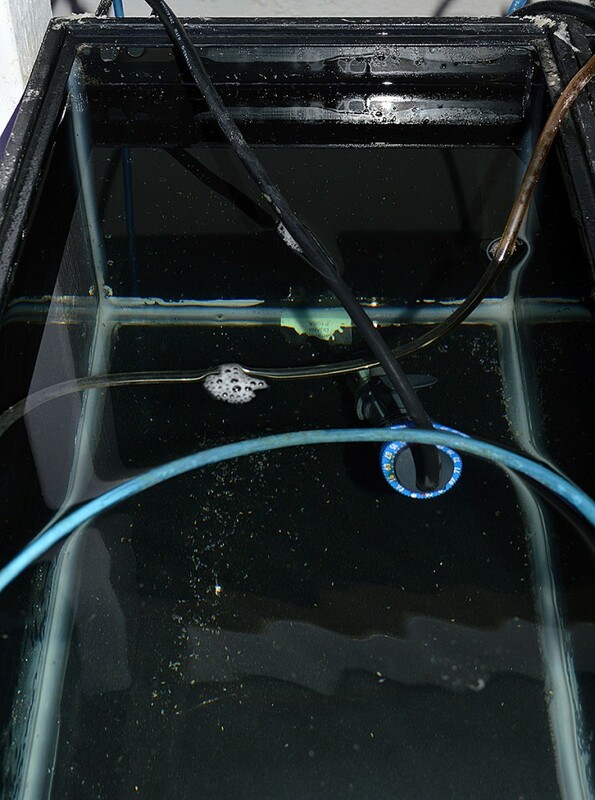 The Ecoxotic cube had been up and running for a while with a single holdback Lightning in it, so I swapped the fish and simply added in my Lightnings as a pair (they had formerly been neighbors, side by side) on 1/21/2014. Initially, things went very well. Here’s some video the day after, 1/22/2014. Unfortunately, things didn’t continue down this blissful path. A few days later, the larger fish turned on the smaller fish, damaging a few fins and forcing me to segregate the fish around 1/25/2014. 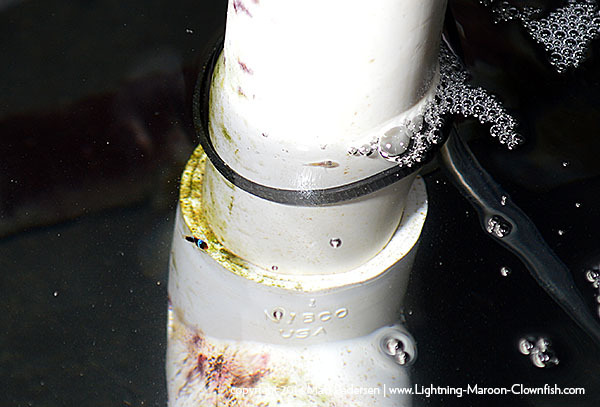 Currently, it is the larger, “future female” Lightning Maroon who resides in a drilled specimen cup. I should mention that somewhere in January I shuffled some fish around and introduced my two F1 PNG White Stripe holdbacks to each other as well. The pairing has gone so-so. 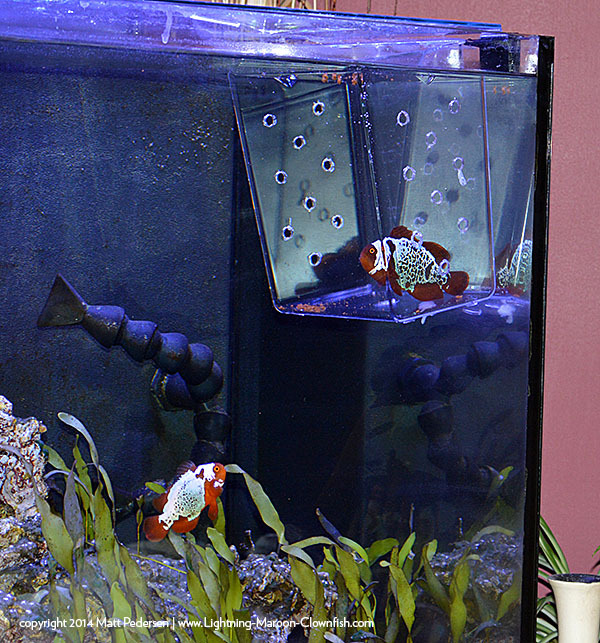 They are not paired, but they continue to share their tank, the smaller fish cowering in a protected area but not otherwise excessively abused. I’ll try to snag some photos at some point. This will be a very important pairing to breed, as it will help definitively answer the question as to whether the “white stripe” siblings carry any special genetics (and it will prove or disprove the presence of a recessive Lightning gene).